Last Updated: April 9, 2019 · Published: January 29, 2016 By: Asian Caucasian Leave a Comment This post may contain affiliate links or sponsored content. I’m a stir-fry freak! (Just sayin’.) I think the wok was one of the greatest inventions ever! I use it quite often, mostly for nights when I have tons of fresh veggies in the fridge that need to be eaten. 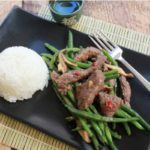 Adding a protein, like in this stir-fry beef recipe, completes the meal. Use this recipe as your “template” for creating stir-fry meals using whatever is in your fridge! In a medium bowl, whisk together cornstarch, soy sauce, and rice wine until the cornstarch is dissolved. Add the beef, sprinkle with pepper and toss to coat. Set aside for 10 minutes. Meanwhile, cook green beans in a large pot of boiling water for maximum 3 minutes, just cooked but still crisp tender. Drain and “shock” the beans in an ice bath for 3 minutes to maintain its color. Drain beans and set aside. Heat a wok over high heat and add the oil until it ripples in the pan. Stir fry the beef evenly in the wok for 1 to 2 minutes until seared. Cook another 1 minute until just done. Transfer to a plate and set aside. Add the garlic, chili pepper, and ginger to the wok and stir fry about 20 seconds. Add the mushrooms for another 2 minutes. Add the green beans and stir fry for another 1 minute. Return the beef to the pan and add the fish sauce, the remaining 1/2 tablespoon of soy sauce, and the black pepper. Combine together well. Serve with sticky white rice.